By defining and managing product backlog items, your team can capture the requirements of the product. Your product owner defines, prioritizes, and maintains your backlog items. Your team estimates the effort, the business value and the priority for each backlog item and delivers the highest priority items in each sprint. To view a product backlog item, you must be a member of the Readers group or your View work items in this node must be set to Allow. To create or modify a product backlog item, you must be a member of the Contributors group or your Edit work items in this node permissions must be set to Allow. When your product owner defines a product backlog item, he or she should focus on its value to your customer and avoid descriptions of how your team develops a feature. The product owner can prioritize your product backlog based on each item’s business value, effort, and relative dependency on other backlog items. The product backlog will evolve quickly if the business requirements of your project and other conditions of your team change constantly. To minimize redundant work, your team can specify details only for the highest priority items. When you create a product backlog item, you must specify the Title. You can leave all other fields blank or accept their default values and update them later. In Title (required), type a short description. In Iteration, specify the iteration path of the item. You can specify the root iteration path to start and then move the item into a sprint during a sprint planning meeting. In the Assigned To list, click the name of the team member who owns the item. Only members of the Contributors group can own a work item. In the State list, leave the default value, New. For more information about the State field and how you use it to track workflow, see Changing the State of a Product Backlog Item later in this topic. In the Reason list, leave the default value, New backlog item. In Effort, type a number that indicates the relative rating for the amount of work that the item will require to implement. A larger number indicates more work. In Business Value, type a number that indicates the relative business value of the item. In the Area list, specify the appropriate area path. For more information, see Create and Modify Areas and Iterations. On the DESCRIPTION tab, provide details about the product backlog item. On the ACCEPTANCE CRITERIA tab, describe the criteria that you use to verify whether your team has fulfilled the requirements of the item. On the HISTORY tab, add comments that you want to capture as part of the historical record. Every time that a team member updates the work item, its history shows the date of the change, the team member who made the change, and the fields that changed. On the ATTACHMENTS tab, attach files that provide more details about the item. For example, you can attach an e-mail thread, a document, an image, or a log file. On the TEST CASES tab, create links from the item to test cases. For more information, see Adding and Linking Test Cases to a Product Backlog Item later in this topic. On the TASKS tab, create links from the item to tasks. 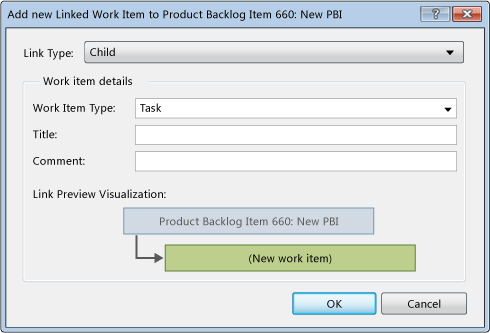 For more information, see Adding and Linking Tasks to a Product Backlog Item later in this topic. On the LINKS tab, create links from the item to other backlog items or to other types of work items, such as impediments. You can also add a hyperlink to a Web site or to a file that is stored on a server or a Web site. For more information, see Adding Other Types of Work Items to a Product Backlog Item later in this topic. After you save the item, the identifier appears in the title under the work item toolbar. You link task work items to a product backlog item to track the progress of work that has occurred to complete the backlog item. On the Tasks tab, click New. The Add new Linked Work Item dialog box opens. In the Link Type list, leave the default option, Child. In the Work Item Type list, click Task. In Title, type a name that identifies the area of work that will be performed as specifically as possible. (Optional) In Comment, type additional information. A work item form for a task opens and shows the information that you have provided. Specify the fields that remain, and then click Save Work Item. For more information about fields in the form for a task work item, see Task (Scrum). On the Tasks tab, click Link to. 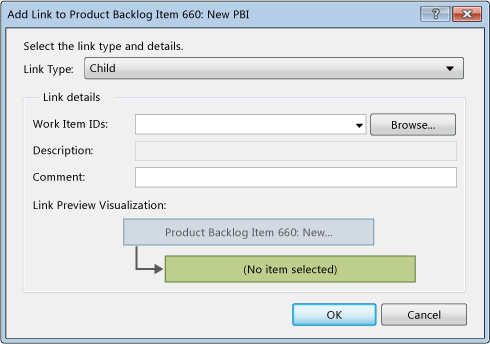 The Add Link to Product Backlog Item dialog box opens. The Choose linked work items dialog box appears. 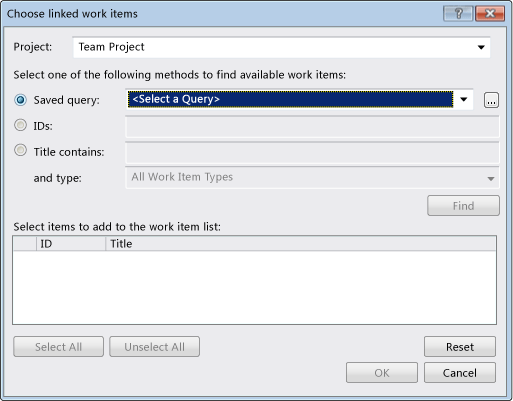 Run a query to locate the tasks to which you want to link. Type the IDs of the tasks to which you want to link. Type some text in the titles of the target items, and then click Task as the work item type. Select the check box next to each task that you want to link to the backlog item, and then click OK. The Choose linked work items dialog box disappears. For more information, see Find Work Items to Link or Import. (Optional) Type a description of the tasks to which you are linking in the Add new Linked Work Item dialog box. Click OK, and then click Save Work Item. Both the backlog item and the tasks to which you linked it are updated. A parent link to the backlog item is created for each task that you added. As part of planning, you create test cases and link them to product backlog items. The recommended client for creating test suites and test cases is Microsoft Test Manager. 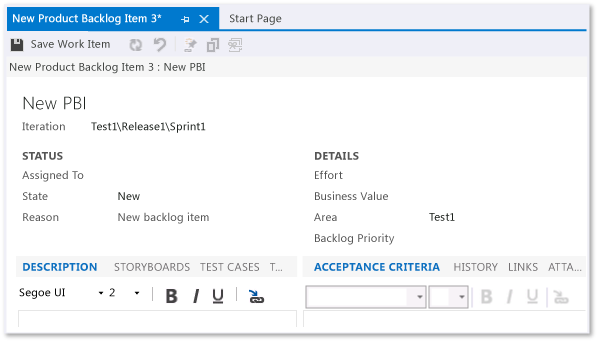 From this client, you can also link to a backlog item, as described in How to: View Product Backlog Items, User Story, or Requirements Work Items Using Microsoft Test Manager. On the Test Cases tab, click New. In the Link Type list, leave the default option, Tested By. In the Work Item Type list, leave the default option, Test Case. In Title, type a descriptive name that defines the area that will be tested. A work item form for a test case opens and shows the information that you have provided. Specify the remaining fields, and then click Save Work Item. For more information about the fields in the form for a test case, see Test Case (Scrum). On the Test Cases tab, click Link to. In Work item IDs, type the IDs of the test cases to which you want to link, or browse for them. You can run a saved query to locate the test cases that you want to add, and then select the check box next to each test case to which you want to link. For more information, see Find Work Items to Link or Import. (Optional) Type a description for the test cases to which you are linking. Both the backlog item and the test cases to which you linked it are updated. A Tests link to the backlog item is created for each test case that you added. You can add any type of work item to a product backlog item on the Links tab. For instance, you can better track the quality and completion of the backlog item if you define an impediment work item and link it to the backlog item. On the Links tab, click New. In the Link Type list, click Related. In the Work Item Type list, click Impediment. In Title, type a name that describes the blocking issue as specifically as possible. A work item form for an impediment opens and shows the information that you have provided. Define the remaining fields, and then click Save Work Item. For more information about the fields on the form for an impediment work item, see Impediment (Scrum). A team can track the progress of a product backlog item by setting its State field to one of the following values: New, Approved, Removed, Committed, or Done. 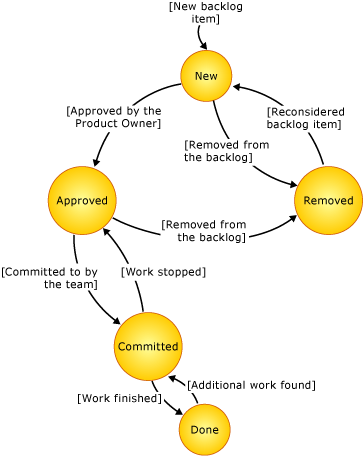 The following diagram shows both a typical and an atypical workflow progression of a backlog item. Create a product backlog item in the default state, New. Change the state from New to Approved. Change the state from Approved to Committed. Change the state from Committed to Done. Change the state from New to Removed. Change the state from Removed to New. Change the state from Approved to Removed. Change the state from Committed to Approved. Change the state from Done to Committed. When the product owner approves the item for the product backlog. When the product owner decides that the team does not need to implement the backlog item. When the team has committed to implementing the backlog item in the current sprint. When the team will not implement the backlog item because product requirements or other work conditions have changed. When the team reconsiders the backlog item. When the team has completed the backlog item and has fulfilled its acceptance criteria. When the team has found additional work that the backlog item requires to be complete. When the work for the backlog item has stopped because of staff changes or priority adjustment. You can modify the workflow to add states, reasons, and transitions.